Ik wens jullie prettige eindejaarsfeesten en een 2007 vol ontplooiing tot duurzame schoonheid. Graag wil ik met jullie enkele inspirerende gedachten voor deze kerstperiode delen over kennisuitwisseling en Vrede. Ik heb ze onlangs heb gelezen in een boek over Kennismanagement. The project "treatment of conflict" tries to visualize the dynamics of the processes of 'conflict'. In a number of different scenarios we simulated an agent system whose members interacted, exchanged ideas and learned from each other. All the agents were subdivided into groups which had different values (Economic situation, Sense of Justice, Responsibility, Rationality, Peacefulness...). We had to define different groups just as we had to define the rules of interaction. The research hypothesis in the project is the following. If we leave people to exchange freely between each other, without expressing themselves clearly as a group member (and sticking to the characteristics of that group), leaming and the exchange of ideas take place very quickly but evolve towards self-organization without conflict. If, by contrast, the exchanges are based not on the convictions of the separate individuals, but instead on the values of the group to which the people claim to belong, these populations do not reach a system without conflict (or at least, not without great difficulty). The first results seem to confirm the research hypothesis. This observation suggests that it is extremely difficult to find solutions as long as people negotiate via perceived groups and their representatives. With some careful consideration, we can easily observe that an evident source of conflict in companies will also be the perceived group values and the way exchange and learning do not take place in such a situation. 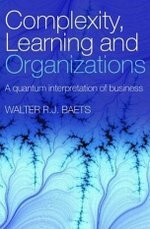 Het boek heet "Complexity, Learning and Organizations. 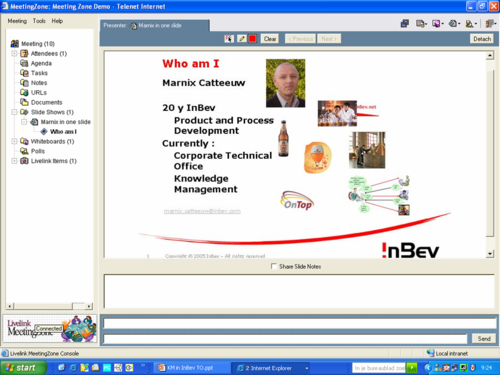 A Quantum interpretation of business". Het is van de Belgische professor in Complexiteit en Kennis Walter Baets. Het boek is aan te bevelen voor wie diep wil nadenken over kennis, leren, communicatie... Maar de praktische consequenties moet je zelf invullen.